Man, this Rangers team. For twenty minutes this afternoon, they once again looked flat, losing battles for pucks and letting the Devils play more or less the type of game they'll need to play to be successful. The second period didn't start much better: Ilya Kovalchuk had a breakaway less than a minute in. We were taking some notes during today's game, and the we found ourselves writing the same thing during much of the first period, and at the very beginning of the second: "How are the Rangers not losing this game?" That question, of course, has an answer: Henrik Lundqvist was outstanding in Game 3, and for the second time in this series, he shut out the Devils. Just like Game 1, this game was scoreless after 40 minutes, but the Rangers played their best period in the third, scoring three times (including an empty netter) en route to a 3-0 victory. 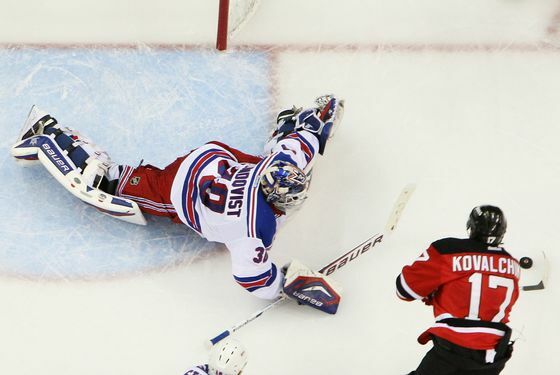 This wasn't a carbon copy of Game 1: Unlike the series opener — in which the Devils controlled play through two periods — the Rangers started to find their game in the second. John Tortorella called a time out early in the period — it had become apparent that the intermission didn't do much to tilt the ice back towards the Rangers — and as the period went on, the teams would trade chances. (The line of Chris Kreider, Derek Stepan, and Ryan Callahan generated some especially good opportunities.) Give credit to Martin Brodeur, who was sharp when he needed to be in the period, but Lundqvist matched him save for save (and then some). But just like in Game 1, the Rangers upped their game in the third period. They'd score their first goal just 3:19 into the period, when Brad Richards won a power-play draw back to Dan Girardi, whose wrister beat Brodeur — yet another big goal by a Rangers defenseman. Then, less than two minutes later, shortly after John Mitchell did a nice job gaining the zone and getting the puck deep to Callahan, Kreider redirected a Ryan McDonagh shot past Brodeur to extend the lead to two. (That goal, by the way, was Kreider's fifth of the playoffs, the most ever for a player who's never appeared in a regular-season game, according the NHL.) The Rangers' penalty kill came up big in the third — New Jersey, which was 0-5 with the man advantage on the day, had two power plays in the period after the Rangers took their 2-0 lead — and Callahan would add an empty-netter to complete the scoring with 2:13 remaining in the game. What more is there to say about Lundqvist? It's apparent that the Devils are trying to get chances off deflections after the Rangers blocked so many of their shots in Game 1, but unlike in Game 2, it didn't work today. (This seems like a rather hard plan to execute on a regular basis: Shooting the puck around a would-be shot-blocker and deflecting it past a goalie is not an easy thing to do.) Lundqvist kept the Rangers in this game while his teammates struggled to find their way offensively, and he was equally unbeatable once the Rangers scored those two third-period goals to give him a bit of a cushion. One imagines that Brandon Prust will at least have a hearing for his somehow unpenalized elbow to the head of Anton Volchenkov, and if he's suspended for Game 4 — and if neither Brandon Dubinsky nor Mats Zuccarello is ready for game action by Monday — John Tortorella might have to get creative with his lineup. (Perhaps Stu Bickel, who was scratched today, would get limited minutes as a forward? Or maybe John Scott might see his first action of the playoffs?) Volchenkov, by the way, didn't seem to suffer a serious injury on the play, and finished the game. And while that sort of thing shouldn't be considered when Brendan Shanahan doles out supplemental discipline, it is. Still, it's hard to argue with Peter DeBoer's take on the incident: "headhunting, plain and simple." Speaking of Game 4: The Rangers have still never lost a playoff game at the Prudential Center — they're 4-0 now — and a victory on Monday night would give them a commanding 3-1 lead in the series, and move them to within a win of a trip to the Stanley Cup Finals. But it can't be repeated enough that this Rangers team has had serious problems winning when they have a one-game series lead: They're 0-6 so far in these playoffs in such situations.